Do You Donate Art For Fundraisers? There are always opportunities for today’s artists to donate their artwork for fund-raising galas and events. This is a great thing to do while the country’s market is struggling. No matter what’s going on in our society, artists will continue to create. But…. maybe sales have slowed. Is your studio full of unsold works? Mine can get pretty crammed. Why not donate it? Donating art gives you the chance to once again feel good about your art. So, you don’t “make” any money, you at least make someone else happy and participating in a good cause. 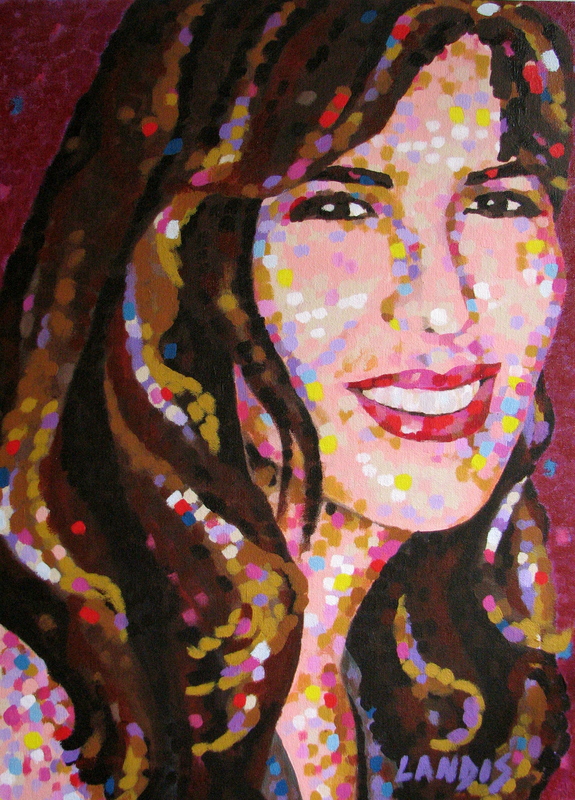 I am currently donating a certificate for a 16 x 20 inch pointillism portrait. It will be in a silent auction supporting the Scottsdale Desert Stage Theatre. http://www.desertstages.com/support_dst/gala.html The auction will host hundreds of art patrons. Not only will my commissioned original portrait be an auctioned item but the marketing possibilities are huge. I will have this portrait on hand to demonstrate my unique style of painting, as well as lots of Landisworks business cards, postcards, my bio and artist statement. Hopefully, I will get a few new commissions. I can also promote my new exhibited paintings at the Kivi Moments in Time Fine Art Gallery, also located in Oldtown Scottsdale. It’s the perfect marketing strategy. If you are a Phoenix area artist why not do the same? Donate your art. You’ll feel good about it. Elvis was the first singer I remember hearing on a vinyl record. My mother bought the 45 “Teddy Bear” when I was a mere munchkin and played it often. A small but dearly loved collection of Teddy Bears reflected my favoritism to this song. I recently attempted to sing “Teddy Bear” ( ala Karaoke) at a party and DID NOT DO HIM JUSTICE. I basically massacred the song… Sorry Elvis. Fortunately, I can paint images of him. So today, January 8th 2010, would have been the 75th birthday for my childhood idol. I can’t even imagine him as old. 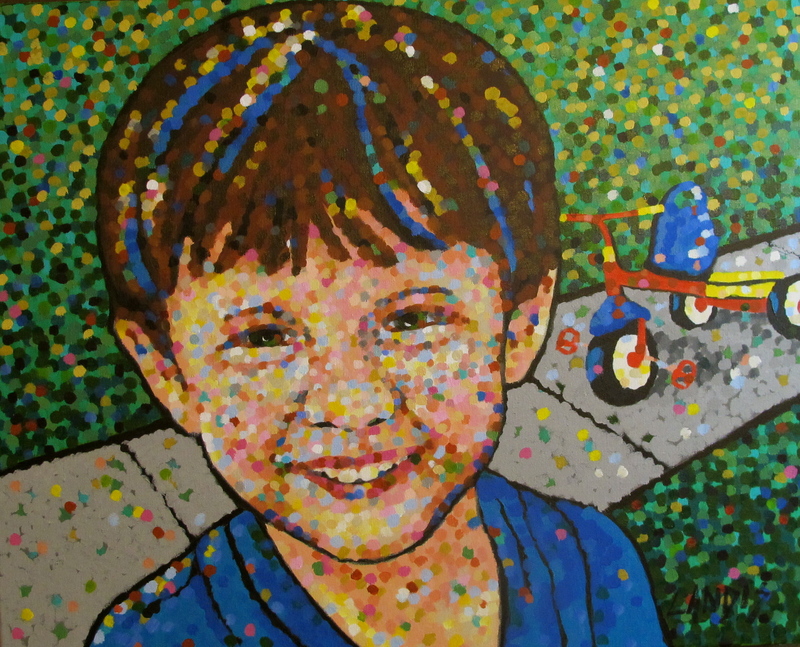 I still see him through that toddler’s eyes as seen in this image I painted in 2009. Happy Birthday Elvis! Rock on! 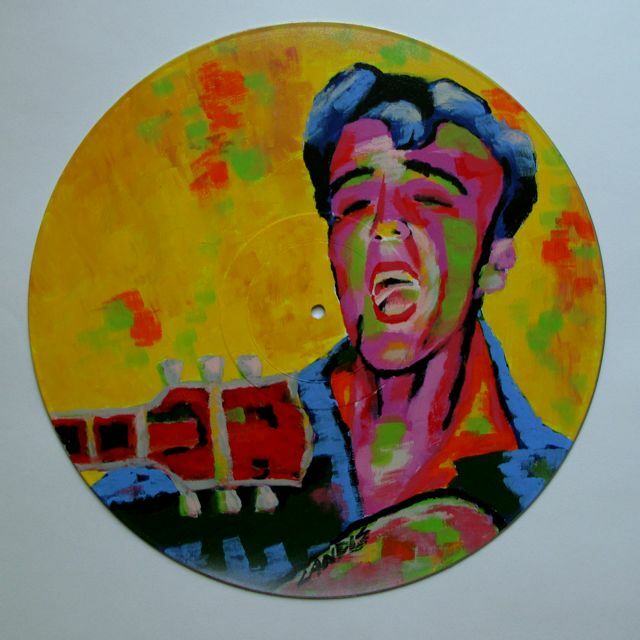 FYI: If you are an Elvis art collector, I plan multiple painted images of Elvis this year. I have an upcoming exhibit in July that has me busy planning my new Elvis art. Each piece will be available for purchase. Special orders are encouraged. Let me know if you have a specific image of “The King” in mind. Occasionally, it will take me quite a while to complete a portrait. Therefore, the photograph used for reference is “old” before the painting is started. And the portrait captures the age of of the subject at the time of the photograph. My new portrait of a little boy already shows it’s age. He doesn’t use a “sippy cup” any more. I’ve captured his toddler years; now, long gone. He’s four years old going on “young man”. I’m hoping this young man won’t mind looking at his “Sippy Cup Portrait” for the rest of his life. It’s a time capsule. This weekend will be filled with excitement as the Artists of the Superstitions, a group of artists inspired daily by the beauty of a huge mountain range in central Arizona, USA. We will gather together at twenty-one artist studios in the small communities of Apache Junction and Gold Canyon located east of the Phoenix metro areas. There are forty+ artists displaying items in multiple mediums ranging from the fine arts, functional arts, to creative crafts, and jewelry. Studio doors open at 9am and remain so till 4pm both Saturday and Sunday. Each studio is different, as are the artists’ personalities and individual art pieces. I will be selling my handmade beaded jewelry and large Pointillism paintings as well as demonstrating my unique style of painting with “dots”. Also at my studio is Cheryl Fecht, an oil painter, specializing in intricate interpretations of the Grand Canyon, Lake Powell, and more Arizona & New Mexico locations; Lori Berry will have beautiful fused glass jewelry and art for sale; and Sandra Wilderman will have even more attractive paintings for customers to choose from as they shop for their holiday gifts. Yes, the holidays will soon be here. Why not buy original art and jewelry this year? They make “the best” gifts. For more information about this year’s Artists of the Superstitions Studio Tour and to obtain a map of each studio location, go to http://www.artistsofthesuperstitions.com. Being sick, parched, and feverish reminded me of the Arizona desert dunes so I created “Dunes” a painting on canvas for the Mesa Art Center 10 x 10 Benefit Show which takes place this Saturday Evening (10/10/09). The show will have 110 10 x 10″ works for show and sale by Arizona artists. Each piece will be for sale for $100.00. First come, first choice! Doors open at 6pm. All proceeds will benefit the Mesa Contemporary Arts Exhibitions and educational programs. I hope they raise lots of moolah! Have you ever tried to be creative while sick with a bug? You’re feverish, shaky and just feel like a “loser” for wasting time in bed so you tell yourself, “I’ve got to get up and DO SOMETHING!” That’s where I’m at today. Now normally, I would be inclined to follow the doctor’s order to stay in bed, drink plenty of fluids, let my husband play nurse, etc., etc. BUT I HAVE A PAINTING DEADLINE!!!!!! I’ve entered a show at the Mesa Arts Center http://www. mesaartscenter.com that involves painting a 10 x 10 inch canvas for a special fund raising raffle they are having in the next few weeks. So, I’ve taken all the meds my body can stand and have been at the dining room table painting away. Couldn’t make it to my real art studio a mere 50ft away… Didn’t want to push my lower extremities! My chicken legs are way too wobbly for my personal safety. Here’s my thoughts. Painting while sick has it’s advantages. No dilly-dallying allowed! It makes you focus on each stroke and color to get to the heart of the painting fast. It’s an innovative way to speed up creativity. (If I don’t get it done quickly, I may pass out). Luckily for me, as a Pointillist, my shaky hands aren’t a disadvantage. But this painting won’t end up as one of my perfectionistic works. It will have more fluidity and will be called “Impressionistic”. I like switching things up every now and then. It keeps you growing and stretching as an artist. So while my body doesn’t feel like moving at all, my art continues to move me. Please don’t read into this blog that I am a self-serving artist who just wants to prove she’s The SuperArtist. Believe me, I’m not. But, when it comes to painting, not much stands in the way to prevent me as an artist from meeting a deadline. Maybe I should get sick more often….